I've had downloadable 'quilty' gift tags on my hobby website for many years, and since I'm planning to phase that website out by the end of the year, I'm slowly moving some of the things over here. 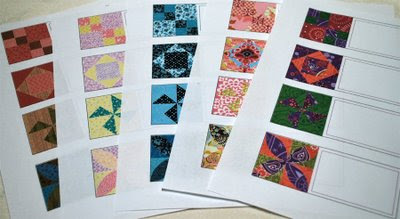 These tags were designed in Electric Quilt and I've updated the fabric scans and changed the block patterns. 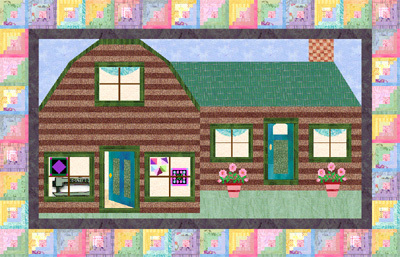 You'll find 4 blocks on each sheet with your choice of fabrics from Mark Lipinski, Jo Morton, Amy Bradley and Marcus Brothers' Aunt Grace and Metro Blue. They're in separate Word documents that you can download and personalize before printing them out. I recommend card stock or heavy color copy paper, but regular printer paper will work fine, too. Click these links for the fabric tags of your choice. These have come in handy at my house when we have a gifting emergency and all we can find are the 500 Christmas tags I bought last December 26th. When I designed them in EQ, I only designed the 'block' side - size doesn't matter. I exported the block and brought it into PhotoShop to make the actual tags. Then I brought the 'tags' into Word to make sheets of labels. Thank you for sharing these. I just love them!